It is very common in geotechnical engineering with Karst geological conditions that the fine particles migrate and lose continuously with water flow in the fractured rock mass, which will lead to the water-mud-inrush accident. 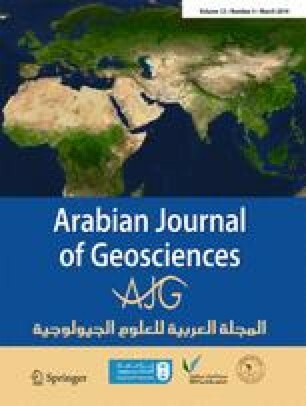 In this paper, the time-varying characteristics of fine particles’ migration and loss in fractured mudstone under water flow scour were investigated experimentally and theoretically. Considering the continuous gradation of fractured mudstone, taking Talbot power exponent as the influencing factor, the time-varying features of the total lost mass were described. Based on the total lost mass, the mass-loss rate and the mass-migration rate of fine particles were proposed, and their time-varying features were compared and analyzed. The loss-migration-ratio was defined, and the water-mud-inrush risk was assessed by the relationships between loss-migration-ratio and time. The research showed that (1) the lost mass resulted from the fine particles’ migration, and the migrated mass was affected not only by lost fine particles but also by the water flow velocity. The rules of the fine particles’ migration and loss in the fractured mudstone had the non-linear and time-varying characteristics. (2) For samples with the smaller Talbot power exponent of n = 0.1–0.5, the fine particles splashing phenomenon occurred, and quite a lot of migrated fine particles were lost. The loss-migration-ratio attenuated with time by a power function. Fractured mudstone with this continuous gradation had a high water-mud-inrush risk. (3) For samples with n = 0.6–1.0, large numbers of fine particles migrated with water flow, but only a few rushed out from the fractured mudstone. The loss-migration-ratio attenuated with time by an exponent function. Fractured mudstone with this continuous gradation had a stable inner structure; therefore, the water-mud-inrush risk was very low. The results will help geotechnical practitioners to assess the water-mud-inrush risk and provide some references for the water-mud-inrush accidents prevention in geotechnical engineering with Karst geological conditions. This work was supported by the National Natural Science Fund (11502229, 51808481), the Natural Science Foundation of Jiangsu Province of China (BK20160433), the Outstanding Young Backbone Teacher of QingLan Project in Jiangsu Province (2016), the Program of Outstanding Young Scholars in Yancheng Institute of Technology (2014), the Program of Yellow Sea Elite in Yancheng Institute of Technology (2019) and College Students’ Innovation and Entrepreneurship Training Program (2018).